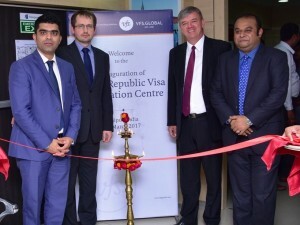 VFS Global has launched its Visa Application Centre for the Czech Republic in Jaipur. Applicants for visas to the Czech Republic from Jaipur can now visit the centrally-located centre to submit visa applications and enrol for biometrics in a spacious and comfortable environment. 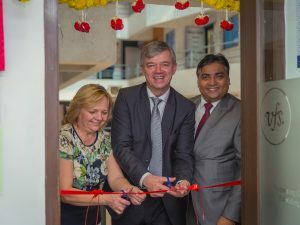 The centre was inaugurated by Martin Smolek, Deputy Minister of Foreign Affairs of the Czech Republic and H.E. Milan Hovorka Ambassador of the Czech Republic in India, and Mayor of Municipal Corporation in Jaipur, Dr. Ashok Lahoty. The new centre in Jaipur is located inside Mangalam Ambition Tower, Subhash Marg (Malan Ka Chauraha), C Scheme, Jaipur. Over the last few months, VFS Global has set up centres in nine other cities in India to increase accessibility to visa services for applicants across the country. Applicants earlier had to travel to Mumbai or Delhi to apply for Czech Republic visas. Over the next few days, VFS Global will launch more such centres for the Czech Republic in India, in a phase-wise manner. Hungary witnessed a growth of 70 per cent in Indian arrivals in 2016 till date, while 40,000 Indian tourists visited the country in 2015, informed Mark Kinces, International Marketing Manager, South-East Europe, Hungarian Tourism Agency. This was revealed at the roadshow conducted by Central Europe comprising of Czech Republic, Poland, Slovakia and Hungary in Mumbai and New Delhi in order to promote the region in the Indian market. “We are not only receiving leisure tourists but also mid-sized groups and MICE travellers to Hungary,” says Kinces. According to Emilia Kubik, Asian Markets Project Leader, Polish Tourist Organisation, 26,000 Indian tourists visited Poland in 2015 and the country expects a 10 per cent increase in Indian arrivals by the end of 2016. Kubik also informed that Poland is also planning to introduce a destination specialist programme for the travel trade in 2017. 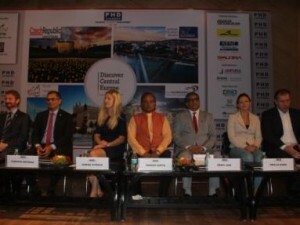 Czech Republic is expecting to receive 50,000 Indian tourists from India by the end of 2016 revealed Karina Vitkova, International Marketing Manager, Long-haul Markets, Czech Tourism while Slovakia has seen a few thousand Indian arrivals and is hoping to increase awareness about the country amongst the travel trade in order to attract more arrivals explains Robert Vincze, Head-Slovak Convention Bureau, Slovak Tourism Board. VFS Global has introduced the On-Demand Mobile Visa Service for Czech Republic, Denmark, Greece, Hungary, Portugal and Slovenia visas applicants across India. Travellers can give their biometrics data and visa application in the comfort of their home or office. A well-trained and professional team from VFS Global will visit the applicant at his/her chosen location anywhere in India to collect the details. The service is ideal for corporate groups, incentive groups, on-campus students and cultural & sports groups. It is available on any day of the week, including weekends across India. VFS offers a dedicated Helpline numbers for appointment bookings and assistance. The applicant can call the country specific Helpline number to book an appointment, pay the fee online and receive confirmed appointment details, following which a team will make a visit at a location convenient to the applicant on the appointed date and time to collect biometrics and accept the application.